Yuuuuuu---um! - Jill Ruth & Co. Cookies!! I won these at Just Something I Made. Delicious homemade and beautifully decorated cookies from Bake at 350. There were six cookies, but 7 of us at home. Hhhmmmm....what to do?what to do? Sharing works! We opened the package on the porch since we were so excited! Thank you Cathe of JSIM! She was celebrating 2 years of great blogging. Have you been to her blog? She melds vintage, recycling, and technology to put us all in awe. Her projects are so inspiring. If you are a suitcase collector--you better check out this post of Cathe's now. She never ceases to amaze me with her creativity! And, thank you Bridget of Bake at 350! The cookies were wonderful!! I aspire to Bridget's cookie expertise. She has tips and beautiful photos of her cookies on her blog. You'll be motivated to break out your cookie cutters. Boy howdy! The girls hit the "jill-pot". 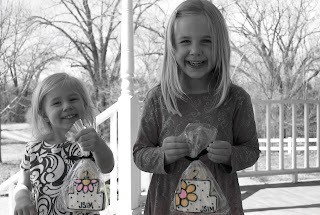 They look yummy and as precious as the girls! Congrats on the yummy, pretty cookies. And JSIM! That woman is a creative machine! Thanks for the link. Yay!!! I hope they are all gone by now! :) You have to make room for Easter candy!!! Congratulations on winning!!! 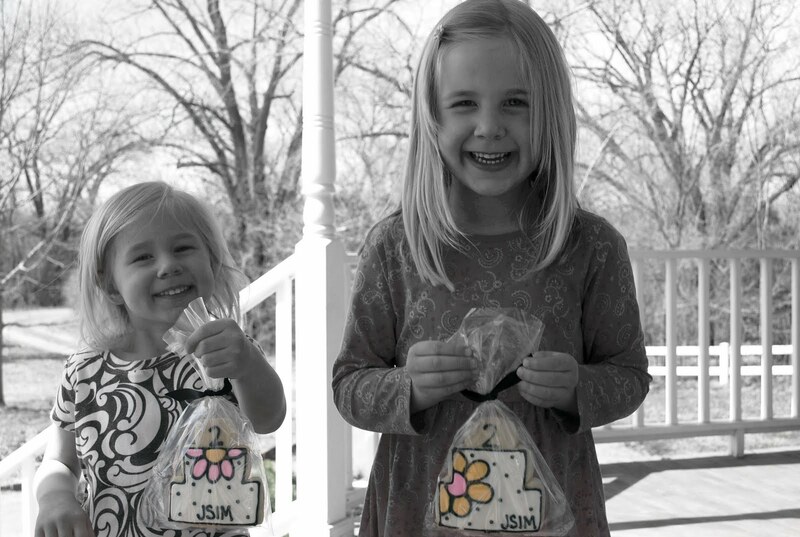 The girls are ADORABLE and man... the cookies look good!! !